Donald Trump has begun his presidency with a series of seismic policy interventions starting the repeal of former president Barack Obama’s healthcare policies, initiating a new US missile defence system and ushering in a new period of American protectionism. The 45th president of the United States, who was sworn into office on Friday, began his four-year term of office with a series of executive orders that would set the tone for his government. It was, he said, a government that would “put only America first”. Before attending a series of inaugural balls around Washington DC, the Republican sat down to sign an executive order aimed at undermining Obama’s signature healthcare law, known as Obamacare. The order notes that Trump plans to seek the “prompt repeal” of the law. In the meantime, it allows the Health and Human Services Department and other federal agencies to delay implementing any piece of the law that might impose any economic cost. Using similar orders, the new president also signed into law a new national day of patriotism and signalled plans to build a new missile defence system to protect against perceived threats from Iran and North Korea. The Trump White House also stripped the official website of all mention of Obama’s key policy agendas, including climate change and LGBT rights along with the civil rights history section. The various subsections of the White House website were replaced with just six; energy, foreign policy, jobs and growth, military, law enforcement and trade deals. 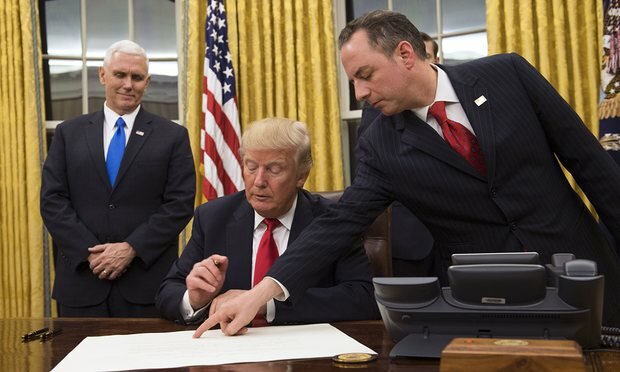 He later said: “We will follow two simple rules: buy American and hire American.” This caused some British politicians to wonder what kind of trade deal the UK can realistically expect. Although not expected to make her first official visit to the US until Spring, Theresa May, who has congratulated Trump on taking office, is reportedly set to fly out to meet him next week, much earlier than expected, in secret plans to make her the first foreign leader to hold talks with the new US president. Trump will have to wait a bit longer to meet Vladimir Putin, however. Putin is ready to meet Trump, Kremlin spokesman Dmitry Peskov was quoted as saying by Tass news agency, but preparations for the possible meeting may take months, not weeks. On Saturday, hundreds of thousands of women are expected to march on Washington, which is set to comfortably outsize Trump’s inaugural crowd. Millions of others will follow suit in cities across the US and across the world. Marches in Australia and New Zealand . Shortly after taking office as the 45th US president, Trump sent his cabinet nominations to the Senate. He signed a waiver to allow retired General James Mattis to serve as defence secretary, even though he left the military less than the required seven years ago. Mattis, whose appointment has been approved by the Senate, was later sworn in by the vice-president, Mike Pence. Pence also swore in John Kelly as head of homeland security. In a separate step on Friday, the White House chief of staff, Reince Priebus, issued a memo directing an immediate “regulatory freeze” to prevent federal agencies from issuing any new regulations. This echoed Trump’s pledge to repeal two existing regulations for new government regulation imposed by his administration. Trump also signed a proclamation declaring a national day of patriotism. At his inauguration balls, Trump brought his signature style to the task of governing, sprinkling his comments at three inaugural balls with references to “phony polls”, campaign victories and social media. Trump was also expected to visit the CIA on Saturday, meeting members of the nation’s intelligence community. The visit may be fraught with tension. Trump has sharply criticised the nation’s top intelligence officials for their assertions about Russian hacking and leaks about his briefings in the weeks before he was sworn in. White House spokesman Sean Spicer told reporters before the inauguration that the visit would involve several departments and Trump intended to offer his appreciation for their service to the country. Before this, Trump is due to attend a prayer service at the Washington National Cathedral, an Episcopal parish with a dual role as a civic gathering place. The cathedral has for years hosted a prayer service for the new president. But keeping the tradition has sparked debate this year among the congregation who are opposed to Trump’s policies. It’s the latest example of the backlash against religious leaders, artists, celebrities and other participants in events surrounding the inauguration. While some in the largely liberal congregation objected to hosting the service, Bishop Mariann Budde of the Episcopal Diocese of Washington wrote in a blog post that she shared “a sense of outrage at some of the president-elect’s words and actions” but also she felt an obligation to welcome all people without qualification, especially those who disagree and need to find a way to work together.